Piles of rocks or stones (Cairns) are found all over the world. They have marked graves, guided travelers and become shrines for worship. Lately it seems like they are the favorite way to mark trails when you hike in the winter so you do not lose your way. Stones seem to have a similar importance for me, my family and a few close friends. 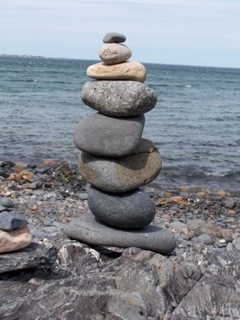 We find ourselves making cairns when we go to the beach. We also have a habit of collecting stones that mark events in our lives. That walk, that hike, that special occasion typically ends with someone getting a new stone. Yes we are the kind of people who give stones as gifts. During this season of being thankful, I find myself reflecting on events, people, and memories that have positively shaped my life. It is easy to reflect when times are good, or when the season encourages us. It becomes much harder when the storms enter our lives. On my desk at work is a small wooden box. The box contains a pile of stones. There is a stone for each of my children. There is stone for my wife, our marriage, and that great walk on the beach. There are stones for other important occasions as well. This cairn is a daily reminder to guide my path especially during hard times. Remembering the positive can be hard, but having a tangible reminder each day helps me to stay on the path. In the midst of a storm, it is all too easy to focus on the chaos, what might go wrong, or how this storm is too big for us to handle. When the storm comes (and they always do) just picking up those stones seems to connect me to what is important…what really matters. As you reflect on what you are thankful for, I encourage you to find a stone or some other tangible way to remember those events. And may it become a way to mark your path.